Bettina Boxall and David Pierson reported on the front page of Saturday’s Los Angeles Times that, “In another blow to California’s parched heartland, federal officials said Friday that for the second year in a row most Central Valley farmers are unlikely to receive water from the region’s major irrigation project this summer. “The announcement, while expected, means growers will probably have to idle more land — and produce fewer crops — because there is simply not enough water for all of their fields. Saturday’s article noted that, “The agency’s initial assessment of how much water they can send to growers is always conservative. There are still two months left in the rainy season and if conditions improve, so could the allocation. Boxall and Pierson explained that, “But for many Central Valley growers, 2015 is looking worse than last year, when they left between 400,000 and 500,000 acres unplanted for lack of water, dealing a $2-billion blow to the state’s agricultural sector. Mr. Carlton noted that, “Farmers, meanwhile, say they will have to continue to fallow fields and take other cost-cutting measures as they try to wait out a drought they say has been worsened by federal regulatory restrictions on how water is allocated. Many get water from alternate sources, including wells or by buying it on the private market, but often at a much higher price than the federal supplies. The Journal article added that, “Dan Errotabere, for example, said his family fallowed 1,200 of the 3,600 acres on their farm in the district last year, ‘and it will be that much or more this year.’ Mr. Errotabere said this year the Fresno County farm likely won’t plant vegetable crops like tomatoes and garlic so well water can be conserved to keep its almond orchards alive. As a result, he said, the farm likely will hire only ’20 to 30′ of the 80 seasonal workers it normally employs. 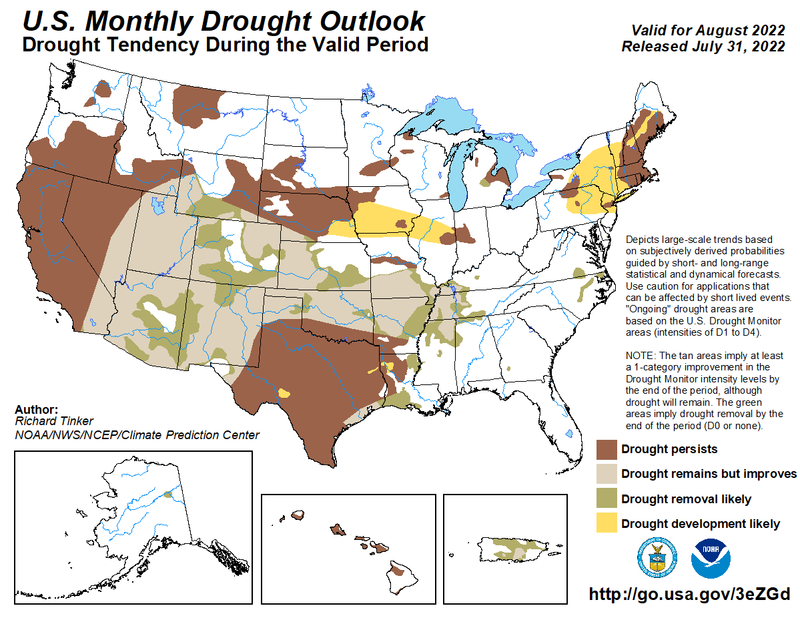 “Drought expansion is also possible across parts of far northwestern California and southwestern Oregon,” the update said.